You’re right, it is! 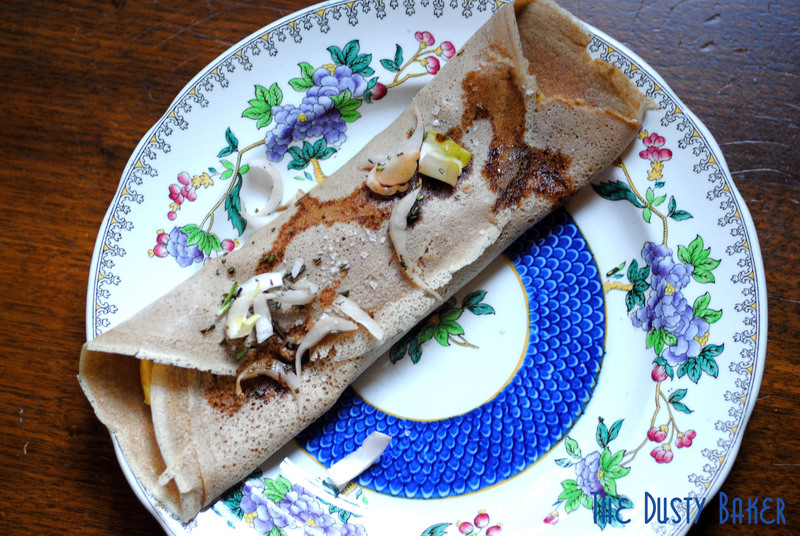 The majority of teff crops are grown in Ethiopia, and I was thinking the opposite when I wrote this post – that I want to learn how to make injera! Pleasure! One of my favorite things about being gluten free are the flours I get to play with – so many to explore! Love the memory making these crepes brought back for you! These look wonderful. Crepes are something I have yet to try. Oh wow! Sounds like these crepes could change the world. I’ve tried making crepes before and it was a disaster area. I must give it another go. It’s definitely worth getting a handle on – because then you CAN JUST START PUTTING ANYTHING IN THEM and it feels SO FANCY!!! I’ve been missing crepes since I was diagnosed with Celiac. Thank you for sharing your thoughts on how teff tastes. Is there a specific brand of Teff that you prefer using? I ask, because I have noticed a huge difference in the way some of the other brands of different flours behave and taste. Bonjour! 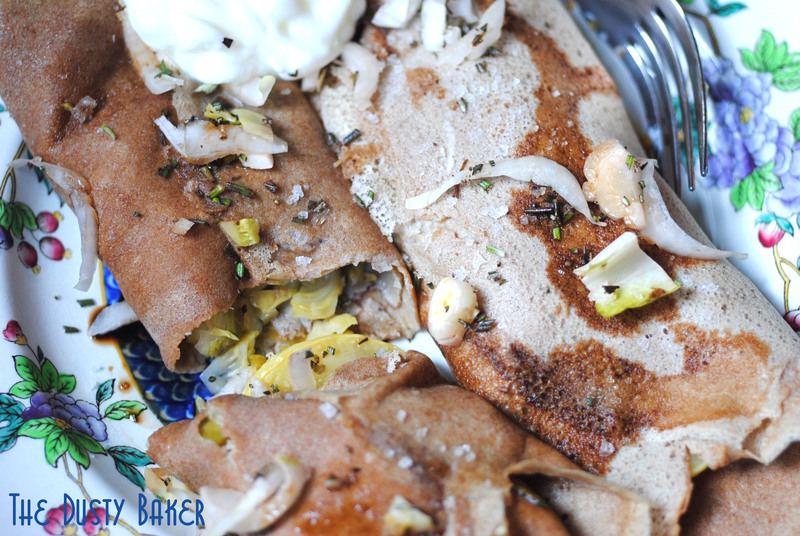 I just made savoury crêpes/galettes with sarrasin flour (buckwheat) last night for Mardi Gras..and happened upon your riff using Ethiopian Teff flour! Could I possibly sub out the tapioca flour for sarrasin…or would the Teff and Sarrasin be too overpowering together…or affect the consistency? I want to compliment you on your technique and finished product …very well explained and detailed..and you obviously have “la geste”/”tour de main” …nailed…Bravo et merci. Tapioca is essentially a starch, so sarrasin wouldn’t chemically replace it. You’d need either arrowroot or cornstarch – it’s literally what will bind it together. 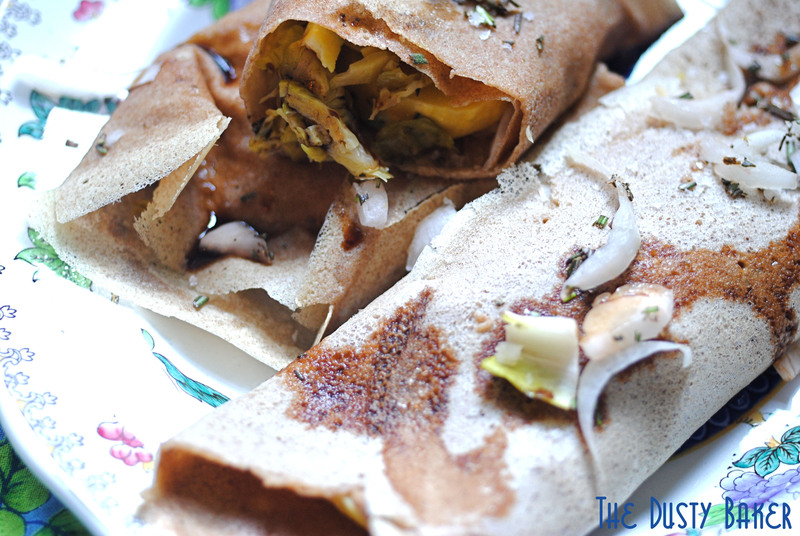 You could try substituting the teff for buckwheat though! Let me know how it comes out – buckwheat and teff are similar, you just need a strong binder in there so they don’t fall apart. And thank you for the lovely compliments!!! Thanks for the inspiration, the crepes definitely look like the ones my French Canadian mother would make! I can’t wait to try this, i have been missing the crepes since being diagnosed with a severe wheat allergy. One question though: you use 1 cup of liquid and 2 eggs for half a cup of flour. Is this right? I never used teff before, maybe it needs more liquid, but my mom’s recipe with wheat flour use 1 cup of flour for the same amount of liquid. Can you confirm please? I haven’t made these in a while now but this recipe worked for me continually. A cup of liquid for a cup of flour seems very high to me – these are thin and use just enough dry ingredients to hold them together. Let me know how they come out for you! I am going to make them into a desert…using pumpkin puree. Mmmmm…. I use teff with pumpkin often… LOVE! Let me know how they work! It is! I LOVE teff… use it a lot in pumpkin recipes too. Send me pics if you take them!